David Lader is a Martial Arts Instructor living in Tucson, and he has been sharing his expertise with hundreds of students for over 25 years. In addition to his experience in various martial art forms, including Hapkido, Gung fu, Akido, Jutitsu, Judo, Capoeira, Muay Thai, Tai-Chi, Hsing-I, and Pa Kua, Lader is a fifth Dan Master of Chung Do Kwan Tae Kwon Do. Aside from his martial arts experience, David has studied various dance and movement styles including yoga and classical ballet. 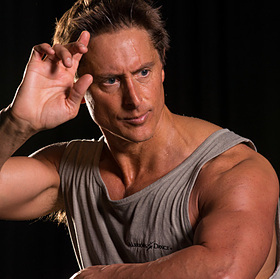 David Lader is also the founder and ongoing developer of Warrior’s Dance, a Martial Arts training regimen that combines his knowledge as a Martial Artist and Dancer into one beautiful and effective training system. “Traditional martial arts systems have evolved historically as warriors and spiritual seekers have experimented with and experienced the effects of various ways of moving. These systems originated as inspired students were moved by and connected with a sense of power seemingly related to a certain source of our consciously incomprehensible universe. Perhaps no one is able to transmit such a sense of connection to another, as it is so very personal in nature. Studying others’ movements, however, may provide us with opportunities to glimpse, or begin to consciously appreciate, this sense of connection, thus inspiring students of movement to become masterful in their own right. To authentically cultivate such mastery, we learn to trust our deeper intuitions, continually surrendering our thoughts, feelings, and bodies with a heightened sensitivity. Consequently, we feel as though we are moved by a power far greater than ourselves. Warrior’s Dance classes provide students with an opportunity to become powerful martial artists through routine practice of flowing and graceful movements. Warrior’s Dance classes also inspire students to safely push themselves to their own mental and physical limits, and there is always a strong focus on fellowship, respect, and dignity. Classes vary significantly in format from week to week, though underlying principles, both physical and mental, remain constant. Warrior’s Dance is wonderful for students of all ages and fitness levels. Any athletes, dancers, or martial artists that want to study movement in a safe, meaningful, and healthy environment should visit Warrior’s Dance. It’s also a playful and exciting way to get in shape, and no prior training is necessary – Warrior’s Dance is for everyone! As your Lead Instructor, David Lader will guide you through your challenging and exciting Warrior’s Dance training. While helping you to maintain a focus on your strengths, helping you with your weaknesses, and reminding you to keep a sense of humor as you go, David Lader's Warrior’s Dance will change the way you walk through life.